This yummy violin game makes music theory and note learning fun! 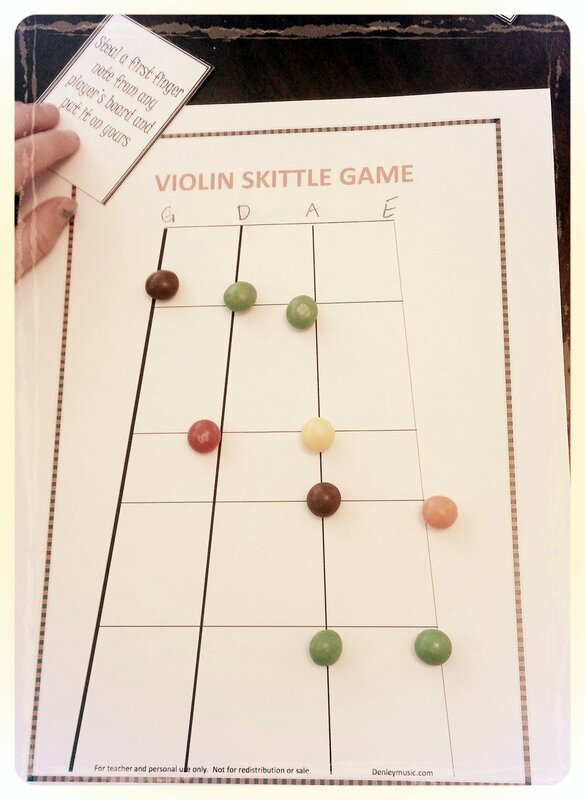 As the music theory obsession continues at our house we are discovering the many fun ways to learn violin music theory and one of our favorites is this skittle game. My kids will play this anytime I let them. Of course, the skittles are a huge motivator in playing, but they also really enjoy the game. It's one that all levels can play and benefit from. This violin game helps teach players the names of notes and where those notes are on the violin. Just follow the links I've provided and print out the free printable game pieces. I printed mine on cardstock, it's nice and durable. All players are given a playing card mat that looks like the violin strings and fingerboard. Going around the circle, you draw a card from the middle pile. The card will have a name of a note on it or instructions. If you draw a card with the name of a note you place a skittle on the violin where you play that note. If you draw an instruction card, you follow the directions on it. Some of the instruction cards say things like, "Eat all the E's from the players board to your left", "Name and place a skittle on each of the 1st, 2nd, 3rd, and 4th finger notes on the A string", "Remove a 3rd finger note". We end the game when all the cards have been used up, but you could flip them over, shuffle, and play until all the skittles were gone, or until it was past the kids bedtime whichever came first. This would be the perfect orchestra game for reward days, or if you have some kids on centers while you work with smaller groups. To play in orchestra break up into smaller groups of 4 to 5 kids. Also, there are two versions of this game on her site, one is for beginners and the other has note cards that show the musical staff for students who can or are learning to read music notation. By the same token you could have your violin students play this as part of group class while they are waiting for their parents to pick them up. 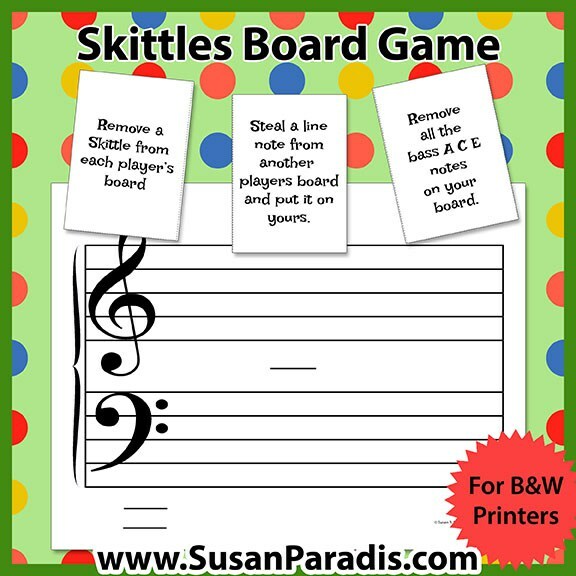 This game printed and cut out along with a bag of Skittles makes a great birthday gift for violinists. If your child or grandchild plays the violin this is a great educational gift to give! Also, makes a great teacher to student gift. Dianna Denley is the creator of this awesome violin version to a game that Susan Paradis came up with for the piano. I've talked about Susan Paradis a lot on my site, she's a music theory genius that has channeled her smarts into creating a lot of great printables and ideas. Some of her printables are geared towards specifically towards piano, but much of it is rhythm or note reading that could be used for violin as well.